A passion for excellence drives Andrew Edwards, CEO of Extron Electronics, the Southern California-based manufacturer of an extensive range of audio and visual solutions. Edwards took to heart the old adage, “If you want a job done properly, do it yourself,” founding the company in 1983 after spotting a market opportunity. Edwards, who started in the industry in the mid-1960s, was working for The Barco importer at the time when he discovered the need for an interface between IBM’s digital graphics output and the projector’s analog input. The RGB 100—and Extron—was born. Starting out in Garden Grove, CA, the company relocated to Santa Fe Springs before settling into a 65,000-square-feet. building in Anaheim in 1995. The RGB 100 was followed by a succession of innovative product introductions that continue to this day. Now, said Edwards, “I have, in the Anaheim area, under lease or owned, 750,000 square feet.” He also built a 140,000-sq.-ft. facility in Raleigh in his home state of North Carolina. Extron has over 30 sales offices worldwide, with main offices in The Netherlands, Dubai, India, Singapore, China and Japan, in addition to the U.S. The 200,000-sq.-ft. headquarters in Anaheim houses The Ranch Restaurant and Saloon. “It’s American cuisine, farm to table; I have a fabulous chef,” he said. The venue also hosts country music performances. “I put in the finest sound system that I could find,” he said, a nod to Meyer Sound. Two Yamaha mixers and Extron speakers complete the set-up. 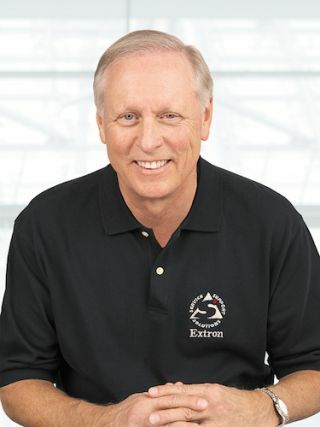 “I always like owning the best,” stressed Edwards, and that extends into Extron’s mission. “I personally guarantee all our products,” he said.